The Texans are re-signing quarterback/special teamer Joe Webb, as Ian Rapoport of NFL.com tweets. He’ll return to the club on a one-year deal worth $1MM. Webb’s status for 2019 was up in the air after the Texans made plans to add A.J. McCarron as Deshaun Watson‘s backup. Instead, it appears that veteran Brandon Weeden is on the outs. Webb, 32, offers unique versatility as a QB, special teams player, and receiver. Last year, he saw just 35 snaps on offense, but took part in 312 special teams plays. Webb’s unique skill set has kept him in the league for a long while and 2019 will be his tenth year in the NFL. Before joining the Texans last year, Webb spent four years with the Vikings, three years with the Panthers, and one year with the Bills. Just one day after being cut, the Texans are resigning quarterback Joe Webb, according to Adam Caplan of Sirius XM NFL (Twitter link). Webb is unique in the sense that he has the ability to contribute both as a signal caller as well as on special teams. He’ll now slide back in behind Brandon Weeden on the depth chart as the Texans’ third quarterback. With DeShaun Watson coming off a torn ACL, it makes sense why Houston would want to have plenty of depth at the position.Webb spent 2017 with the Bills and signed a one-year deal with the Texans back in April. When he checked in at quarterback for Buffalo during last year’s infamous snow game against the Colts, it was the first time Webb attempted a regular season pass since 2011. He had spent the previous three seasons as a core special-teamer with the Panthers. Despite tearing an ACL in November, Deshaun Watson looks like he’ll have some involvement in the Texans‘ offseason program. The one-time offensive rookie of the year favorite is ahead of schedule in his recovery process, just as Bill O’Brien anticipated he would be coming into the offseason program, James Palmer of NFL.com reports (video link). Watson will be throwing some during the offseason. Although Watson is currently working out in a brace on the injured knee, Palmer notes the second-year quarterback may not have to wear a brace once he returns to game action. The former national championship-winning passer will not participate in the team portions of the Texans’ OTAs but will throw during the seven-on-seven and passing portions of the workouts, per Palmer. Here’s the latest out of Houston. The Texans are considering moving center Nick Martin to guard, Palmer reports. The third-year player started in 14 Texans games at center last season, his first as a healthy NFLer after he missed all of his would-be rookie year due to injury. Having reached an agreement with another former Chiefs offensive lineman in Zach Fulton, it’s possible the Texans could slide Martin to guard and Fulton to center — where he played at times in Kansas City. O’Brien said as many as four new starters could be set to block for Watson this coming season. Senio Kelemete and Seantrel Henderson are now in the fold as well. Houston’s highest-paid lineman remains Jeff Allen, who has not lived up to the $7MM-per-year deal he signed in 2016. Martin’s brother, Zack, of course, is arguably the best guard in the game. Tyrann Mathieu may be gradually pushed into a versatile position with his new team. Palmer notes the Texans plan to initially just play him at safety but do want him working at cornerback and as a blitzer. This hybrid job description helped Mathieu to an All-Pro perch in 2015 and a then-record safety contract before another injury sidetracked him and eventually re-routed him to Houston. Joe Webb will make $915K in base salary and will carry a $720K cap figure this season, Aaron Wilson of the Houston Chronicle reports. The wide receiver/quarterback received a $90K signing bonus. Defensive lineman Christian Covington has been fully cleared after his torn biceps injury in October ended his 2017 season, per Wilson. Covington started two games last season and played in seven, doing so after making five starts in 2016. The Texans released right tackle Derek Newton earlier on Thursday and did so with a failed physical designation, Wilson tweets. Newton had not played since October 2016, when he sustained two severe knee injuries on one play. Jordan Matthews’ one-year deal with the Patriots is worth $1MM with $170K guaranteed, Ben Volin of The Boston Globe tweets. The deal includes an $90K guaranteed, a modest $790K salary, and a $130K offseason workout bonus. Matthews was hampered by injuries in 2017, but prior to that, he had three strong seasons with the Eagles, so he could prove to be a major value signing for New England. New Eagles tight end Richard Rodgers signed a one-year deal worth $880K with $245K fully guaranteed, Adam Caplan of SiriusXM tweets. Joe Webb‘s one-year deal with the Texans is for the minimum salary, Mike Rodak of ESPN.com tweets. With his salary at the league’s floor, it could negate him as an unrestricted free agent loss for the Bills and hurt their chance at scoring a compensatory pick. The Texans have signed quarterback Joe Webb, Ian Rapoport of NFL.com tweets. It’s a one-year deal worth $1.015MM. 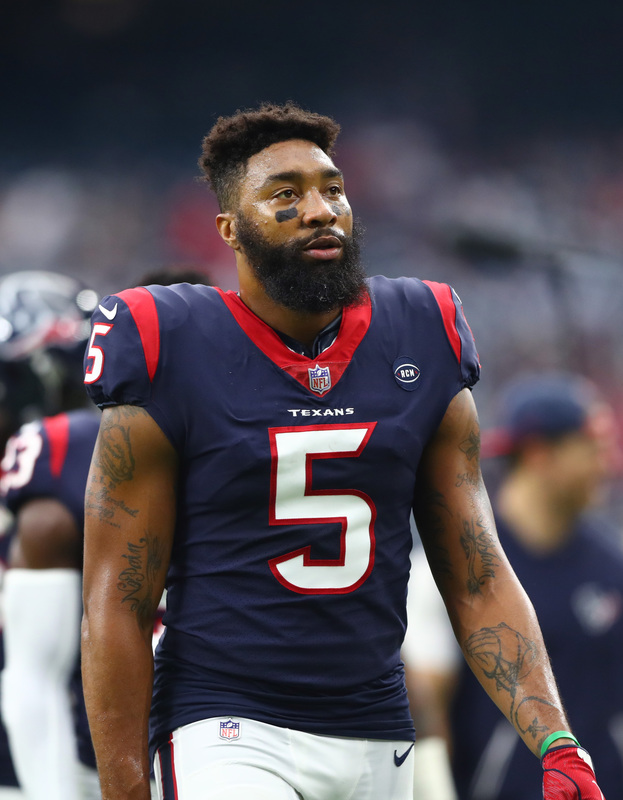 The Texans already had Brandon Weeden and Taylor Heinicke under contract as backups to Deshaun Watson, but Webb gives them an additional option to look at. In theory, Webb could also stick as a special teams contributor and/or a wide receiver given his past experience. Last year, the 31-year-old appeared in all 16 games for the Bills, plus their Wild Card loss to the Jaguars. He played 39 snaps on offense during the regular season and 278 special teams snaps. His last significant action as a quarterback came in 2010 with the Vikings when he filled in for an injured Brett Favre. The departure of Webb marks the sixth unrestricted free agent loss for the Bills this offseason. 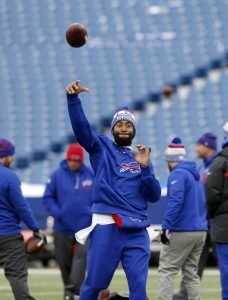 They say networking is everything and connections played at least a small role in quarterback Joe Webb finding his latest job. Sean McDermott‘s Bills have signed the former Panthers QB, according to a team announcement. Webb, 30, is technically the Bills’ fourth quarterback after Tyrod Taylor, Nathan Peterman, and T.J. Yates. However, both Taylor and Yates are recovering from concussions, so Webb has been added for depth. In one or both QBs is cleared in time for the season opener, he might get released before he gets a chance to even suit up. If both players are ruled out for the Sept. 10 game against the Jets, Webb could be on the active roster as Peterman’s clipboard holder. Webb is a versatile athlete who also offers experience at wide receiver. At present the Bills only have five receivers on the 53-man roster: Jordan Matthews, rookie Zay Jones, Brandon Tate, Andre Holmes, and new addition Kaelin Clay. To make room on the roster, the Bills released safety Colt Anderson. The Bills worked out quarterback/special teams ace Joe Webb, according to Field Yates of ESPN.com (Twitter link). Webb was released by the Panthers on Saturday. Buffalo currently employs former Carolina executive Brandon Beane as its general manager, so he has some level of familiarity with Webb. While the Bills have three quarterbacks on their roster, two — Tyrod Taylor and T.J. Yates –are dealing with concussions, leaving rookie Nathan Peterman as their only healthy signal-caller. Last season, Webb appeared in all 16 games for the Panthers while playing mostly on special teams. The 30-year-old also managed one reception and returned six kicks. Cody Davis, S (Rams): Two years, $2.91MM. $805K guaranteed. Max value of $5.1MM after incentives and escalators (Twitter link via Jim Thomas of the St. Louis Post-Dispatch). Kendall Reyes, DL (Washington): One year, $2.5MM. $1MM signing bonus. $6,250 per-game active roster bonus. $850K in playing-time incentives (Twitter link). Joe Webb, QB (Panthers): Two years, $1.86MM. $200K bonus. $50K annual Pro Bowl incentive (Twitter link). Kai Forbath, K (Saints): One year, $840K. $80K signing bonus (Twitter link). Bryce Harris, OT (Falcons): One year, $820K. $60K bonus (Twitter link). Travis Lewis, LB (Vikings): One year, $810K. $50K bonus (Twitter link). Donald Stephenson, OT (Broncos): Three years, $14MM. $10MM guaranteed. $3MM signing bonus. $3MM salary for 2016 fully guaranteed. $4MM salary for 2017 guaranteed for injury at signing. Otherwise, Stephenson’s 2017 salary is guaranteed if he’s on the Broncos’ roster on the fifth day of the league year (Twitter links). Matt Forte, RB (Jets): Three years, $12MM. $9MM guaranteed. $3MM signing bonus. $1M roster bonus due March 15. $1MM salary for 2016 and $4MM salary for 2017 guaranteed. $2MM stat escalator for 2017 and ’18 (Twitter link). Marcedes Lewis, TE (Jaguars): Three years, $12MM. $5MM guaranteed. Jags must exercise $3.5MM club option for 2018 before 22nd day of the league year (Twitter link). Vincent Rey, LB (Bengals): Three years, $10.5MM. $3MM guaranteed as a roster bonus on March 15. $500K roster bonus due on the fifth day of the 2017 league year. $500K playing-time escalator in 2017 and ’18. $12,500 per-game active roster bonus each year. (Twitter links). It’s been a day of huge news around the NFL, with top free agents like Malik Jackson and Kelechi Osemele reaching contract agreements. We don’t want to let some of the smaller deals from around the league slip through the cracks though, so let’s round up Tuesday’s minor transactions…. 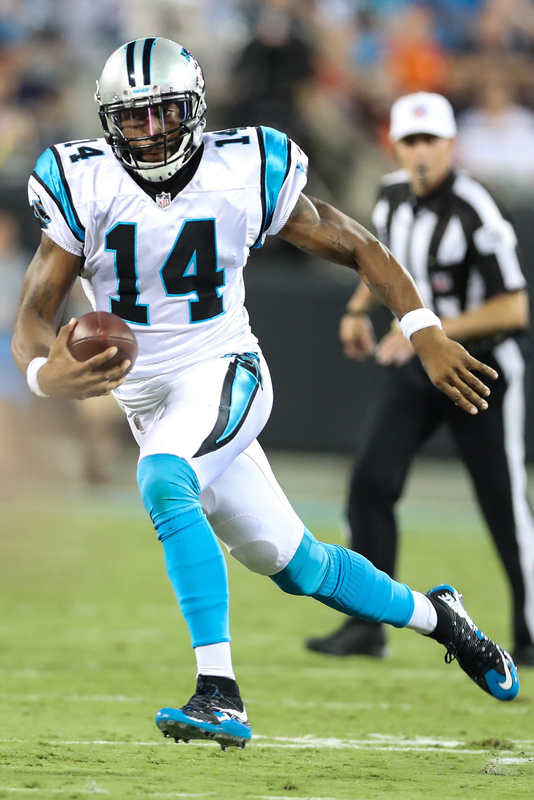 The Panthers have agreed to terms with Joe Webb on a new two-year contract, according to his agency, SportsTrust Advisors (Twitter link). Webb provides Carolina with a third quarterback on its depth chart, and can be utilized as a versatile, all-purpose weapon elsewhere on offense and special teams. The 49ers have re-signed linebacker Ray-Ray Armstrong, extending him through the 2016 season before he reaches free agency, the team announced today. San Francisco claimed Armstrong off waivers from the Raiders in 2015 after the linebacker and special-teamer made headlines for illegally taunting a police dog before a game against the Steelers. The Colts announced today that they’ve signed undrafted free agent long snapper Forrest Hill, in what probably qualifies as the exact opposite of a “splash.” Nonetheless, Hill could be given an opportunity to compete for the job this summer in Indianapolis against incumbent LS Matt Overton. Jaguars tight end Nic Jacobs has signed the one-year ERFA tender he received last week, the club announced today in a press release. Seahawks defensive tackle A.J. Francis has also received his ERFA tender, per Dov Kleiman of RantSports (Twitter link). The Seahawks waived defensive tackle Jesse Williams, according to Tom Pelissero of USA Today Sports (on Twitter).